Congratulations to DOOM Anomaly! 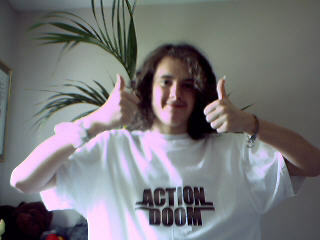 He was our offical winner of the Action DooM: Show Your Support Contest. View DOOM Anomaly's award winning video. Visit http://www.doomworld.com/ for the official contest thread. Visit the Action Runner'sUp Page for all the great runner up entries in the contest. Congratulation and many thanks to all the participants of Doomworld and Newdoom who entered this contest, and made it such a success. If you didn't win this time, cheer up! There will be furture chances to win incredible Action products and prizes! Remember everyone, It's Time for Action!